The time has finally come. It's apple week! Some of my favorite bloggers and I have been furiously working to get a great group of apple themed posts together for you guys. Today we are sharing appetizers and drinks. I can't wait to click over and see what everyone made because just reading the names has made me hungry... and thirsty! An Apple Brie Rollup with an Apple Cider Margarita? Don't mind if I do. Roasted Apple and Acorn Squash Soup and an Apple Pie Smoothie? Sure, I'm in!! So many great recipes all in one spot! I actually made these Apple Cheddar Pinwheels as an appetizer for our annual shrimp boil this year. We love getting our family and friends together. So we had a small group over to celebrate our anniversary. I love having big groups too, but usually there are so many people and I am so busy hosting that I never get to play with our friends' babies. Everyone has had little ones recently and they are growing so fast. So I kept the group small and casual so I could actually play. You should have seen the line of blankets under the shade tree. It was so much fun! I got to play hold the youngest ones and run around with the toddlers. We all had a blast and worked up a hunger. I passed the first round of these little gems. As I walked toward the table to set them down, a few hands reached over to grab a second. That is how you know they are good! 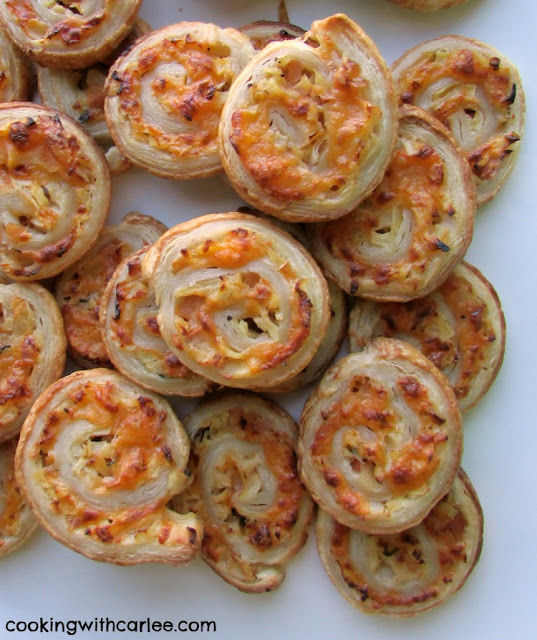 The classic flavor combination of cheddar and apples come together in these delicious pinwheel appetizers. I have been liking using the puff pasty my grocery store carries in the refrigerator section (by the tubes of biscuits), but if you are using frozen puff pastry, be sure it is defrosted. Dice the apple. You can peel it if you like, but I just diced mine fine and left the peel on. Do whatever you prefer. Either way, be sure to chop them really small. In a large skillet, melt the butter over medium to medium-high heat. Saute the onion and apples until the onions are translucent. Remove from heat and stir in the thyme and season with salt and pepper. Unroll the puff pastry. Spread with apple mixture and sprinkle with grated cheddar. With a long side of the dough facing you, roll the dough around the apple mixture. (You want the roll to be long.) Wrap and place in the refrigerator for at least a half hour. Preheat your oven to 450 F and line a baking sheet or two with parchment paper. Cut the roll into 1/2 inch slices and arranged pieces on the lined baking sheets. Bake for 12-14 minutes or until golden. 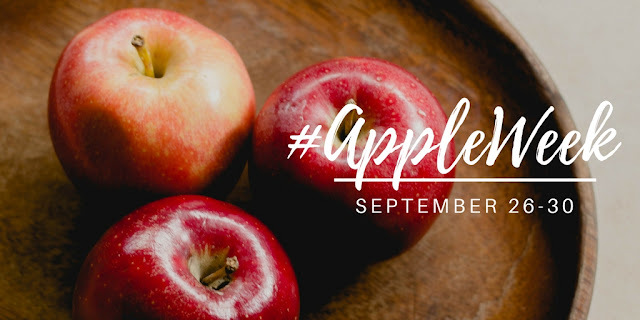 For more AppleWeek recipes, check out the AppleWeek 2016 page! Looks like a perfect accompaniment to my Friday night glass of wine! That sounds like a pretty great Friday night! Thanks, Shelby! The older I get the more I prefer small casual gatherings over large shindigs. These are the perfect little apps to set out for folks to enjoy with a cocktail before dinner. I like doing the big ones too, it gives me a good excuse to make a ton of food. It's just hard to keep the food coming and feel like you got to spend any quality time with your guests. So small and casual was a good break! Thanks, Wendy! 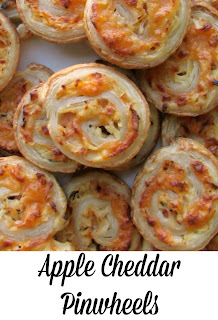 I have always loved apples with cheddar cheese so talk about the perfect appetizer this time of year! Johnagolds are always my favorite for baking. I love that you added some thyme in there, seems like the perfect seasoning complement. This Apple extravaganza has got me so excited! I love Johnagolds too! I picked up a bunch of honey crisp for just eating and have been doing some baking with pink ladies. It is fun watching the rotation of apples at the orchard. I can't wait to go get more! Thanks, Andrea! 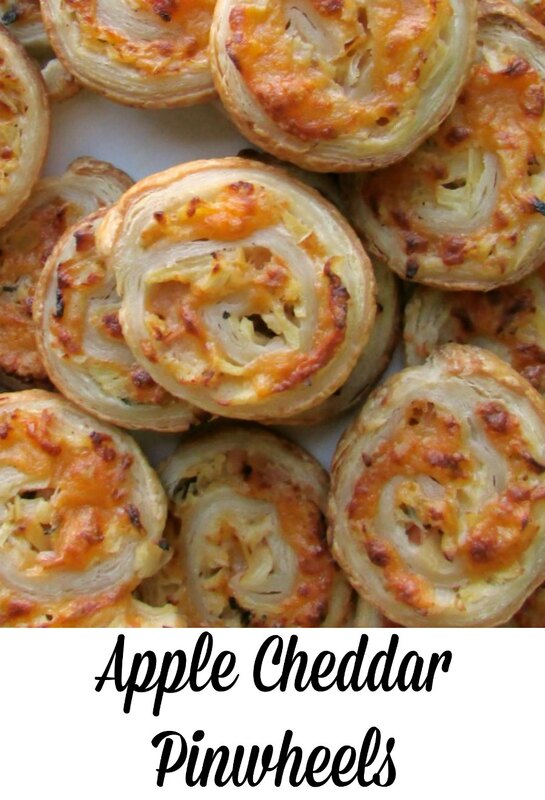 I love apple and cheddar together and I have a feeling I wouldn't be able to stop eating these! Look great. It's easy to keep reaching back for more. Thanks, Caroline! Oh yum! I am so glad I stopped by today. I could live off of appetizers! Believe it or not, I have never used puffed pastry. 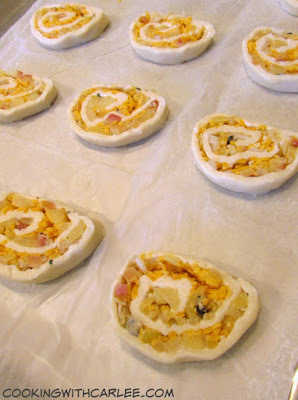 I usually use crescent rolls for things like this, but am definitely going to try this soon. Thanks for sharing! Me too! Well, appetizers and desserts anyway ;-) Puff pastry is a lot of fun to play with and gives a good crunch. You'll have to give it a try. I should try these with crescents too though, I bet that would be good as well! Thank you! Brilliant! I doff my cap to the expert. Thank you! We really need to work together on a meal, you smoke the meat and I'll make the fixin's. Such a great looking appetizer! I love cheddar and apples together! Thank you, Heather! It's one of those classic combos! These sound fantastic. At the catering company I work for we do a pinwheel with sausage, mushroom and parmesan, I am definitely forwarding this to my boss to use as a fall alternative to the regular pinwheels. I am sure that everyone will be reaching for a second as soon as they get a bite of the first. Oooh, that version sounds delicious too! A little sausage with the apples would be good too. So many possibilities! Thanks, Nikki! Ha! It's time to start putting them together again! Thanks, Jessica! Make two batches! Share one and hide the other ;-) Thanks for stopping by! Oh yeah.... I am so making these!!! You should! They are so easy and really good! OMW Carlee, these all sound and look so delicious, #WAYWOW. I have got to try the apple cheddar pinwheels and that slow cooker apple cider pull pork. Thanks, Michelle! Aren't all of these apple treats the best? Hi Carlee, don't you ever run out of recipe ideas. This recipe is so simple, but not something I would ever think to do. 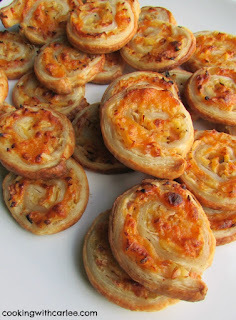 At first I thought they were made with a bread dough, but using ready made puff pastry makes this recipe even simpler! Unfortunately my list of things to make is longer than there are hours in the day ;-) I even put reminders in my phone calendar sometimes because I think of stuff I want to try off season... I think it maybe be a sickness! These look absolutely delicious! I bet they would taste amazing with anything. Thanks for sharing with the Tips and Tricks Link Party! We will really enjoy your Apple Cheddar Pinwheels, what a great idea! Hope you are having a great day and thanks so much for sharing with Full Plate Thursday. Do you prefer to serve these hot or at room temperature? I serve them at room temperature. They cool really quickly, so you can more or less serve them straight from the oven though. I hope you enjoy them! These are incredible! I've made them a few times already and they're a new favorite among friends. I'd like to make them for Thanksgiving -- how well do you think they'd hold up if they were refrigerated overnight and then just cooked on Thanksgiving? Thank you so much!! You can definitely make them a day ahead. Just wrap the log of rolled dough tightly in plastic wrap and refrigerate. You could probably make it even further ahead and freeze it, then thaw in the refrigerator overnight. I haven't tried freezing it though, but I can't imagine it would hurt anything. This look divine. Could I bake them then refrigerate to use the next day? It would probably be better to make them up to the point of slicing and baking them. Just wrap the rolled log in plastic wrap and when you are ready to serve them, just slice, bake and serve. I would be afraid they'd get soggy if you refrigerate them baked, but I've never tried it. Or bake them a couple of hours ahead and just store them in an airtight container until they are ready to serve. Has anyone made these and then put them in the freezer unbaked? I haven't done it with this particular recipe, but I have done it with similar recipes and it worked great. I can't see why it wouldn't work here. So bland. Looked cute. Will not make again. I'm sorry you found them to be bland. They went over really well here. You could definitely amp them up with stronger cheese or a bit more spice if you'd like. Oh no! Chopping them very definitely helps. I'm sorry you had problems! Yay!!! Apple Week is here! Your pinwheels are a fun start. Off to view what the others have shared. I made these ***exactly*** by the recipe. They were HORRIBLE! Even after baking on parchment for 30 minutes in a new high end convection oven, these were soggy and very greasy on the bottom and barely cooked on top. To experiment, I left four in the oven for a total of 45 minutes to no avail. There was no browning on top and the cheddar cheese leaked out of the bottoms of all of the pinwheels and burned on the ones I baked longest. My taste testers were “meh” on the flavor, but that’s personal preference. Sorry, back to the drawing board on this recipe. I'm sorry that was your experience, I am not sure what could have gone wrong. They've worked out well for me and I've seen pictures from others who have made them as well. It's always disappointing when things don't work out like we'd like, especially on Thanksgiving!